Think all pies are created equal? Think again. Not Mamie’s pies! Mamie’s are pretty darn special and indulge-worthy. 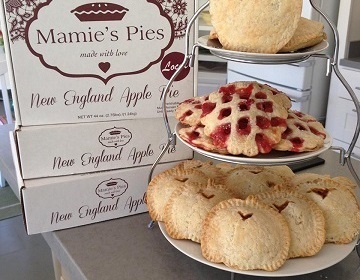 Sigona’s is super excited to introduce Mamie’s locally-made, New England-style pie pockets from Mamie’s Pies in San Rafael, CA. We think they are pretty darn special and indulge-worthy — and after you try them, we’re confident you will agree. These homey desserts are the perfect ending to your dinner and your guests will surely appreciate them too. Mamie’s pies come in three favorite holiday flavors including pumpkin, apple and strawberry. Pumpkin: Shaped like a pumpkin, this pie’s buttery, flaky crust is filled with sweet pumpkin, whipped to perfection and finished with just a kiss of molasses and brown sugar. Apple: This cute apple-shaped pie uses the same melt-in-your-mouth crust as the pumpkin version, but this one is chock-full of sweet-tart McIntosh apples. And the natural sweetness of McIntosh Apples means very little sugar is added to this pie. Strawberry: This all-time favorite pie pocket has a big sweet berry taste and of course, it’s made with Mamie’s signature crust. In all her growing up years, Kara Romanik of San Rafael had never tried a commercially-baked pie. Her mother and grandmother were such good bakers, and baked so often, that Kara grew up eating pies from made from scratch, and recalls that she absolutely loved them. In fact (as often happens with the things we grow up with), she never realized that all pies weren’t as good as her mom’s and grandma’s. She simply assumed that all pies, homemade or store-bought, tasted that good. Until the day she tasted her first store-bought pie. That’s when she realized just how special her grandmother’s pies were. Following her grandmother’s tradition, Kara adapted her family’s pie recipes and baked the same pies for her own children. But it didn’t start out to be a business: The idea of Mamie’s pies started from an effort to support and fundraise for one of Kara’s daughter’s Winter Formal dance, which was close to being cancelled due to the lack of funds. Kara offered her daughter’s school pie samples and volunteered to make some for fundraising if they liked them. The next morning Kara had a big pie order from the school. Excited and nervous at the prospect of having to create so many pies, Kara had to think of a plan. Her initial plan was making the pies and freezing them, along with quick and simple baking instructions on the package. This way, the person who bought it would be able to enjoy a freshly-warm pie right out of the oven. Making the pies was not a problem. The issue was storing big quantities; therefore she reached out to a local grocery store, which gladly helped Kara’s cause. As a thank you gift, Kara gave the grocery store’s director a pie to try for himself. He absolutely loved it and ordered some for his store to sell. After seeing and hearing all the positive feedback from everyone that tasted the pies, Kara knew she had something real special. Inspired by Kara’s mom Mamie, Mamie’s Pies was born and launched to the local community in 2012. Kara’s delicious Mamie’s Pies has been a true success because they are baked with love and care. 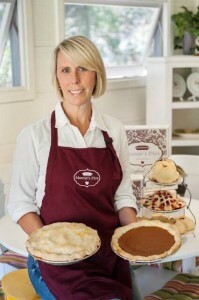 Her pies are made from scratch and in small batches for perfect taste and quality every time. Since Mamie’s pies are unbaked and frozen, they don’t contain any preservatives, so you get to enjoy the aroma and taste of freshly-baked pie right in the warmth of your home. No Thanksgiving menu should be without Mamie’s pies. They’re the quintessential holiday dessert and whether you serve them with whipped cream, ice cream or alone—they’re simply irresistible. Come on in from Nov. 19-25 and get two FREE Mamie’s pocket pies with your in-store purchase of $30 or more! To redeem, simply present this coupon.